Rhys - TOTALLY INTO IT! Elon Musk, my kids, definitely my wife. Fun, Energetic, Creative, Compassionate, Different. Creating cultures that deliver exceptional outcomes. When I was 16 thought the GM made a lot of money and had a good job, so thought I would give it a crack. The interaction with people in a fast paced environment suited my personality. It’s a space that’s always changing. There’s so many aspects of the business to keep on top of and understand. 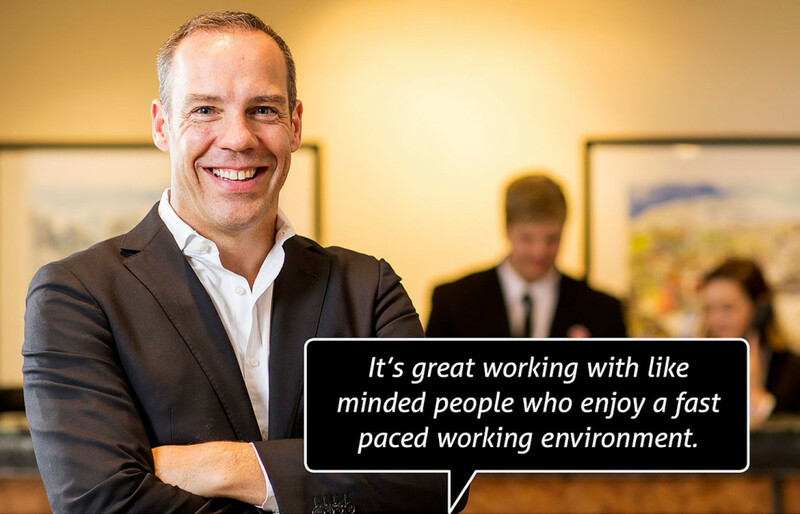 It’s great working with like minded people who also enjoy a fast paced working environment. There’s always so much to learn. Seeing the hotel full to capacity in all areas and it’s just pumping along, delivering a great emotive experience to all our guests. I’ve had plenty. Becoming a corporate cadet, then a GM at 26. Seeing the people I have worked with move on to bigger and better things. Hard to say… being part of the opening team for QTS. Heading up another hotel group and achieving outstanding results. Just see where the opportunities are. But definitely in the ‘design driven’ hotel space. You see the good and the bad in people, and the challenge is to always deal with the bad, and ensure it doesn’t propagate throughout the team. Go for it. It’s a great product on the move and growing. Simply, this is the best time to get into this space. Be prepared to work hard. Be flexible, always be positive, and you will go a long way. Sure – Bono, Elton John, Robert Pattinson, John Key. Can you bust any Hotel career myths? Pay is good once you get up to senior management! Tell us about one of your best Hotel experiences? One of the most fun was running a hotel during the rugby world cup. The hotel was totally full of fun people from England, Ireland and Scotland. We all had a great time and the hotel was basically one big party for 4 weeks! Not really other than to preserve and remember that if it was easy everyone would do it. Part of the journey is pushing through some of the difficult times and coming out the other side a better person and leader.